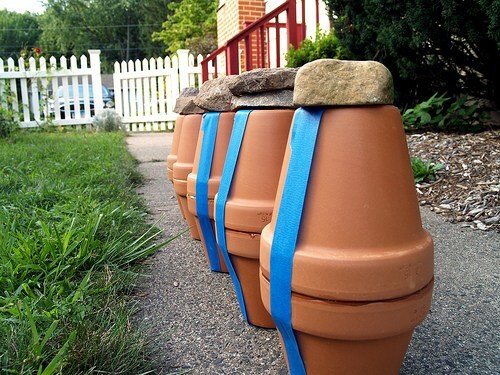 We love all kinds of craft idea using clay flowerpots and since we sell so many sizes of standard clay pot's you should be able to find all the pots sizes you need. Here they take a flowerpot and turn it into something special by coating it with rope that is painted to match your decor. This project is easy and fun to do and makes a wonderful gift. 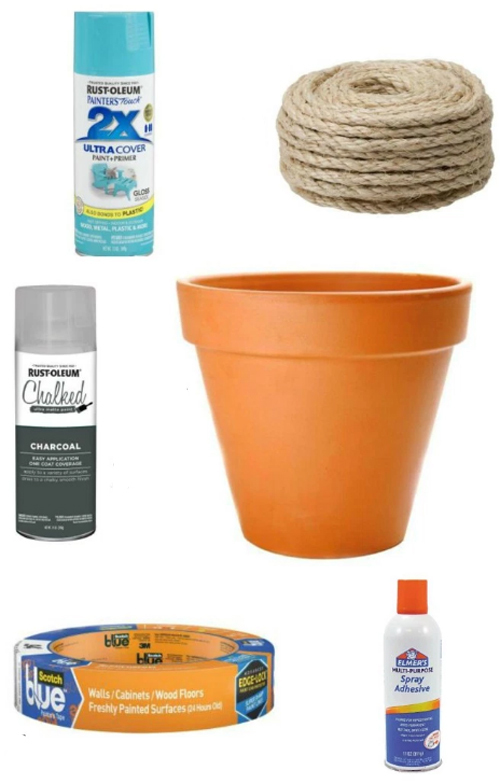 Turn the flowerpot over and spray a thick coat of spray glue around 2" of the bottom of the pot. 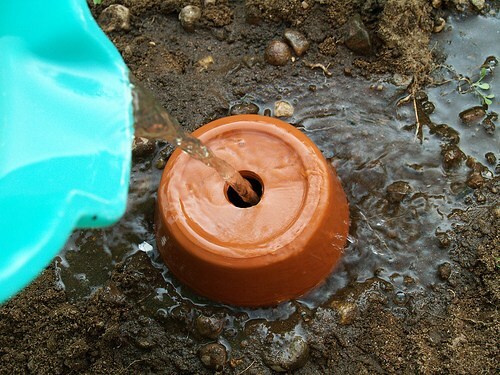 Start with the end of the rope and start wrapping around the pot without any gaps. Then spray glue again about 2" or so up the sides and then wrap the rope some more. When you get to the end spray another coat over the top to just make sure that the rope will stick. Next take some painters tape and wrap it around the body of the pot at the area where you want the color added. You can make as many patterns that you want. 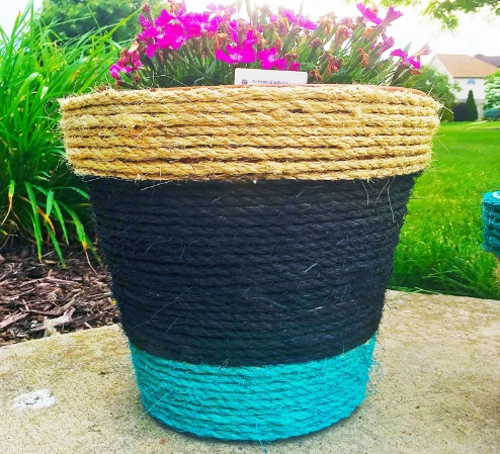 Be sure and leave some of the rope in its natural color to add some beauty and interest to the final look of the planter. Let them dry and then remove the tape. Perfect! craft pots, roReape pots, painted rope pots, diy craft pots, crafty garden planters, craft projects. What is Black Clay Pottery? When you are searching the web for new and original garden pottery, or maybe the old standby terracotta clay and you see the term "Black Clay" and wonder what exactly that means, then here is the answer! 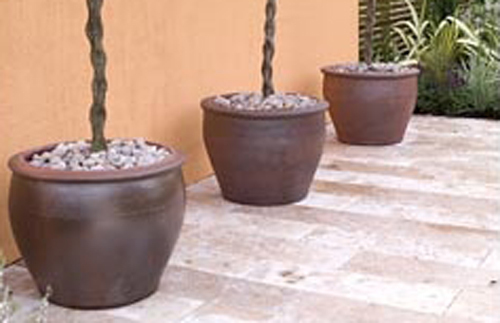 Many of the garden containers coming out of Vietnam use the term Black Clay. 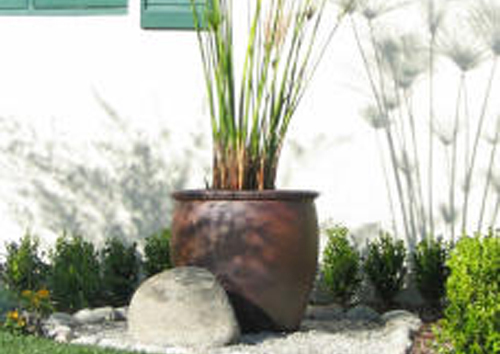 When you look at the photos of the pots they don't look black at all but a dark brown and this causes some confusion. Well let's start by what it really is. Imagine when you are standing at a riverbank in Vietnam and you are looking into the running water and the water looks dark almost black. It's not the water you are seeing it's the soil on the river bed that is a dark brown. Well, when that clay is harvested off the river beds it looks like a dark brown. That is where the term "Black Clay" comes from. Then the clay is formed into shapes or placed into molds to form the planters. Each one is then moved into a huge mud hut where it is baked over a number of days till hard. When you see some of these planters and they have darker spots on the side that means they were placed closer to the sides of the kiln where they will heat up more than the pots placed in the middle. The pots are then cooled. And then moved back in and re-fired. 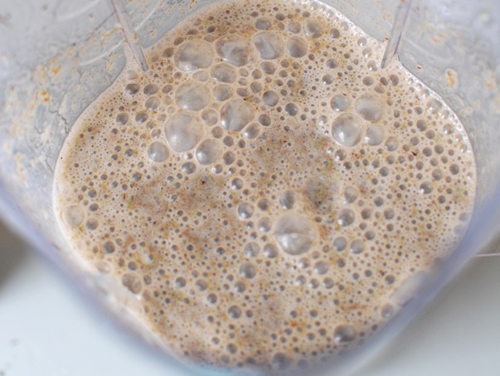 This creates a hard finish like a stoneware pot. It's basically waterproof and will wear like a glazed flowerpot. One word of caution. If the pots gets chipped or cracked, the water you water your plant materials with will find that defect and seep into the pot. Now the pot will start to break down from the inside out. This process is normal. So, hopefully this helps explain where these beautiful clay containers got their name: Black Clay. 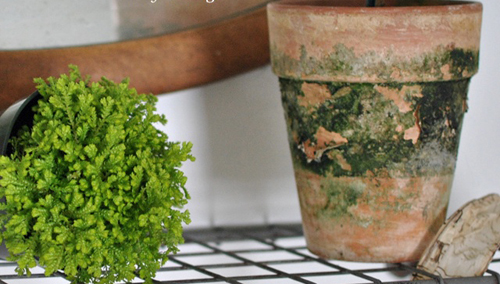 Read more.....Houseplants that clean indoor air. 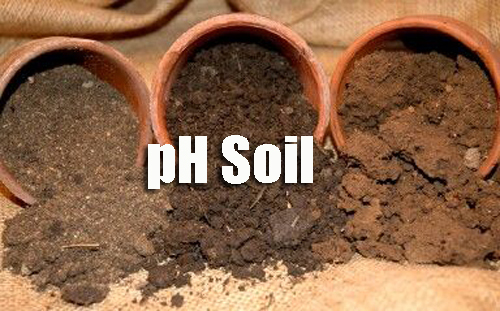 We highly recommend testing your potting soil for pH levels. You ask why? Well here are a few tips and the importance of staying on top of it. When you are planning a potted garden, flowerpots around your home or shrubs and trees in large containers it's important to know if your soil is acidic, neutral or alkaline. 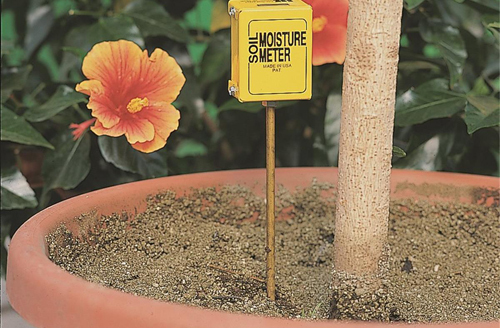 Most plants are neutral but others can be fussy and require a more accurate acidic or alkaline base. When you bring plant materials home from the local nursery, it's important to know if your potting mix need some help to assure that the correct mix is used in the planters for the best outcome of growth and health. The easiest way to test the soil is by using a probe. They will come with full instruction and can range around $20.00 These will work for indoor and outdoor containers and potted plants and flowers. Some require soil being placed into a test tube and adding a powder with water. Others by inserting a probe directly into the soil and get an instant reading. There are many suggestions on how to amend the soil to get the correct reading on the meter probe so google it for specifics. Wood Ash, Sulfur, Meal, Vinegar or Baking Soda can all be added to the potting mix for the best results with the garden containers. Whatever method you decide to follow when planting into pottery, make sure you do a bit of pre-planting to research and adjust the soil to find the perfect blend for you. 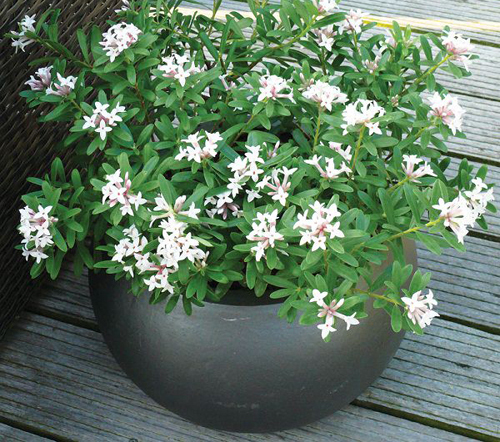 Read More.....Potted Jasmine to help you sleep. As we all know most plants will eventually get root bound when grown in a garden planter. As a plant grows it's roots want to shoot out and expand. Eventually they will become intertwined, yearning to break free. 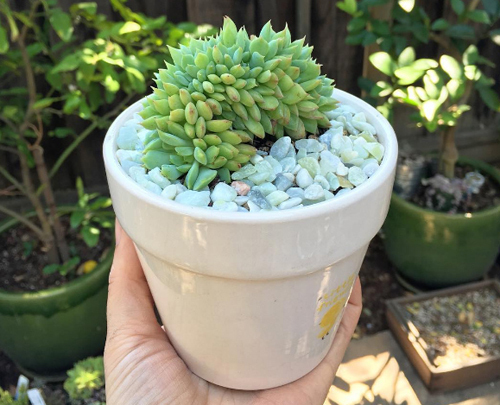 Here are a few tips to help with succulents. Turn the succulent over in your hand and gently loosen from the pot that it is root bound in. Carefully try to spread the roots a bit so that they are moveable and not bound together in a tight ball. Take the potting soil for the new larger planter and mix it with 1/3 sand. Succulents are desert dwellers so good draining soil is a must. Once the succulents have been re-potted do NOT water. Wait a week before the first watering. This will give them time to adjust to the new pot and soil. Then water like once a month. It's tempting to over water but trust us they do not like it. Just make sure that the pot is placed in an area where there is lots of sunshine. If indoors put them on a windowsill. Outside move to a sunny area. 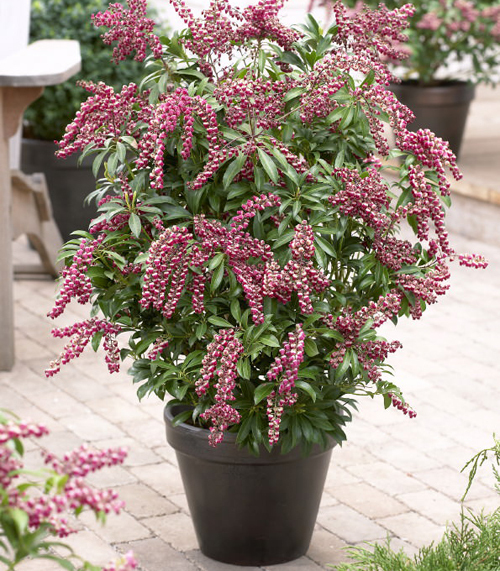 The main goal here is to let them have lots of room to grow, don't over water and place in a sunny window or area. Sounds simple so let us know how you do! Read more..... Need Help Transplanting Plants.